For your American customers, May means it’s almost time for Memorial Day – a patriotic celebration of war heroes who lost their lives fighting for the US army. This holiday gives consumers a three day weekend, and there’s nothing quite like a long weekend to get business booming! 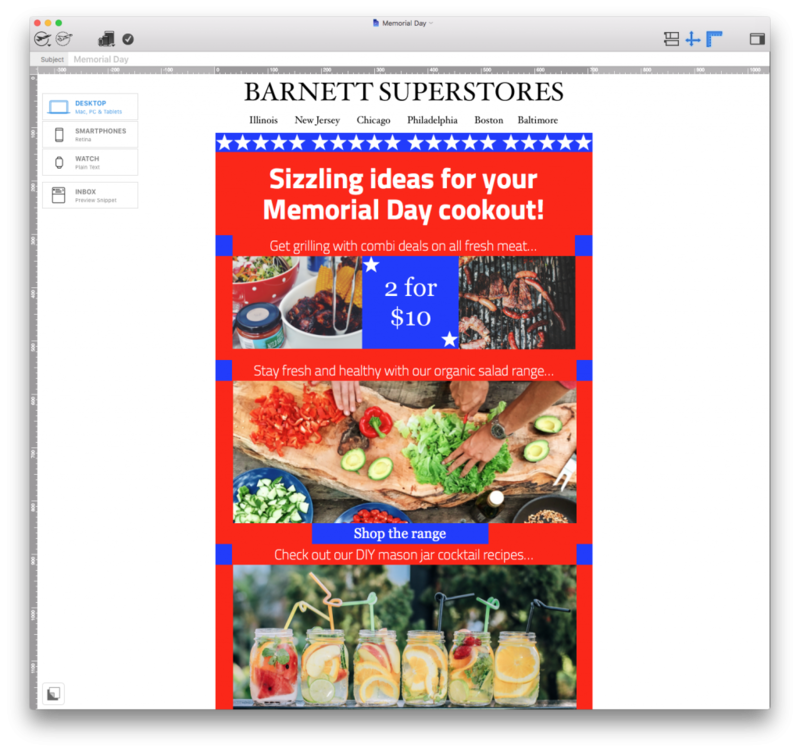 Before you fire up the grill, or pour yourself a drink, check out our 5 tips for creating a sizzling Memorial Weekend email campaign. As this is a super patriotic holiday, you should do your best to try and represent this in your email design. This makes the theme of your email clear from the get go, as well as making things a bit more fun and interesting for your email subscribers. Try to incorporate red, white and blue into your color scheme, and bonus points for you if you can include some American flag imagery in there, too! In this example, Ralph Lauren have got their color scheme down to a T and the inclusion of the stars and stripes flag is a great way to get the theme across to customers. As one of the oldest tricks in the marketing playbook, the sense of urgency is always a good way to engage your customers into participating with your sale or special offer. 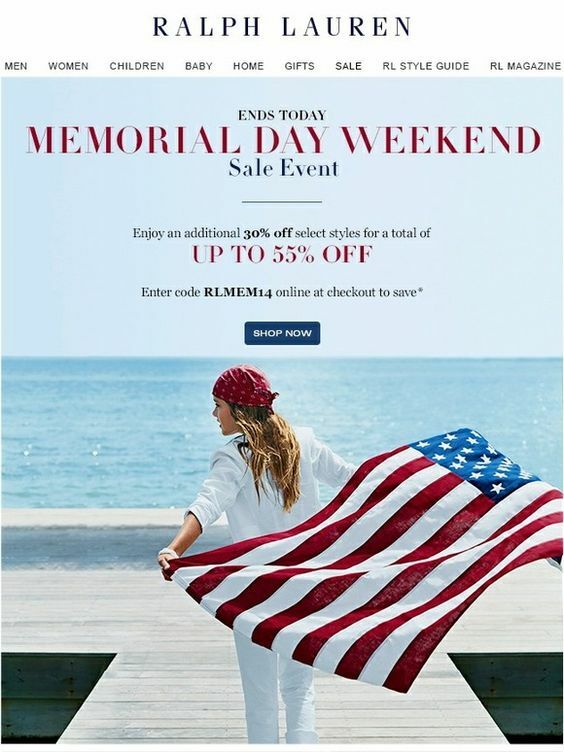 As the Memorial Day holiday is only spread across a couple of days, it provides your business with the perfect opportunity to have a quick-fire sale or event. 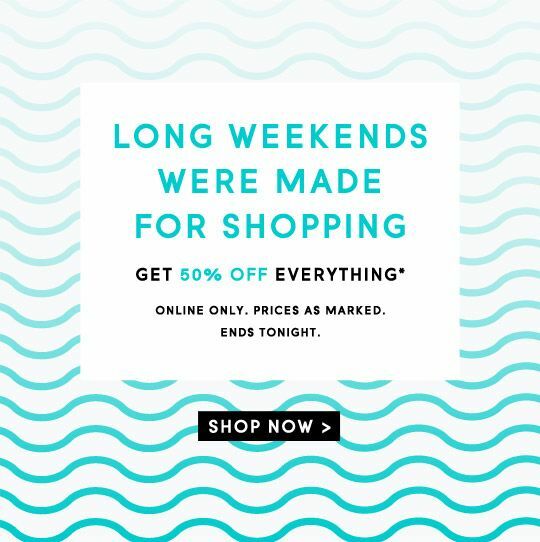 This bright design from Aldo definitely creates a sense of urgency with its “Today only” graphic. Try something similar in your designs to get customers rushing to check out your sale. Remember your email campaign does not have to begin on Memorial Day weekend, you can get started right away! 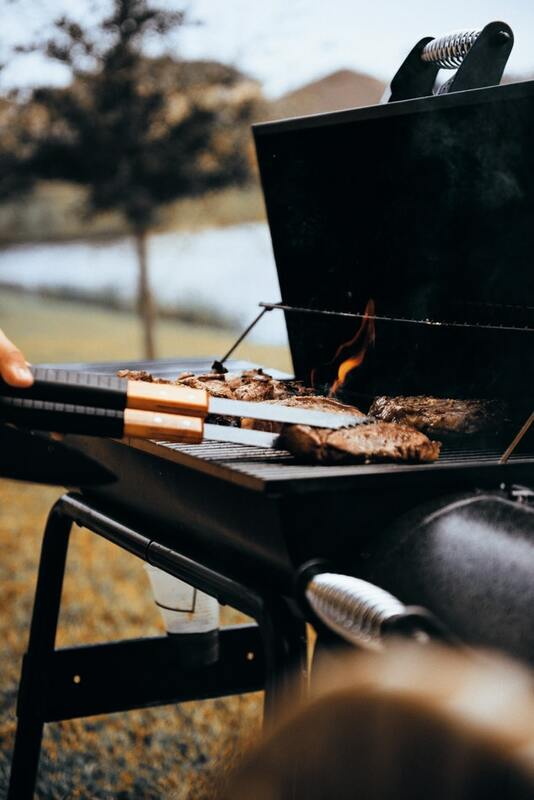 Encourage your subscribers to book a last minute trip, get them thinking about their BBQ or cookout in advance, or suggest fun activities to do over the family weekend. There’s loads of ways to get involved and it doesn’t have to be a themed sale. Get creative and it will pay off. Your customers will definitely thank you for the inspiration! Check out this example made with Mail Designer 365. For many of your customers, Memorial Day weekend is the start of their summer. The weather is getting warmer and many of them will not have to go to school or work. 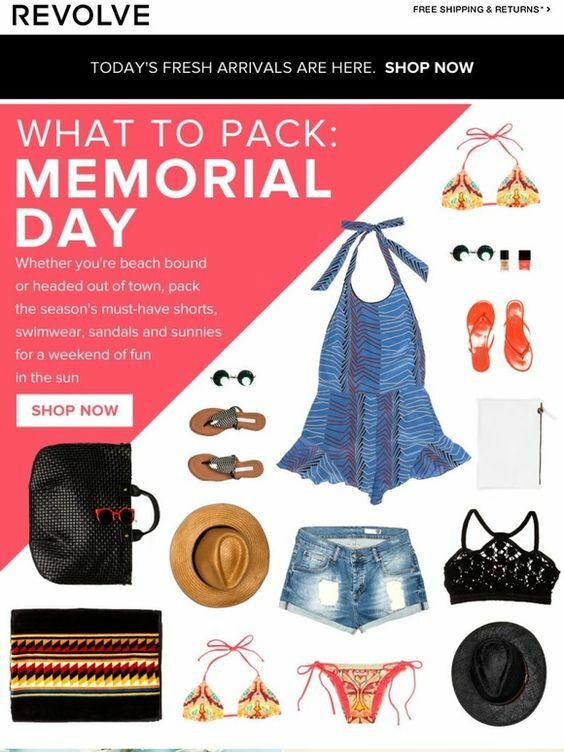 Your subscribers will be looking to update their summer wardrobe and book holidays, so the more you highlight this in your email campaign using a summery theme, the more likely they are to click. This cute and summery design from Revolve is a clever way to inspire your customers to start shopping for the summer. As with all holidays and special occasions, it’s easy to forget the true meaning of the celebration. It’s good to include a reference to what the day is all about. This will not only make your business come across more genuine, it’s also a sign of respect to your customers who may have lost loved ones fighting in the military. You could do this by inserting a short but heartfelt message or by hosting a special event and donating to a veteran’s charity. This design from Alex and Ani has got the balance just right. We love the patriotic heart! Tip: Don’t forget to segment your email lists for this one! 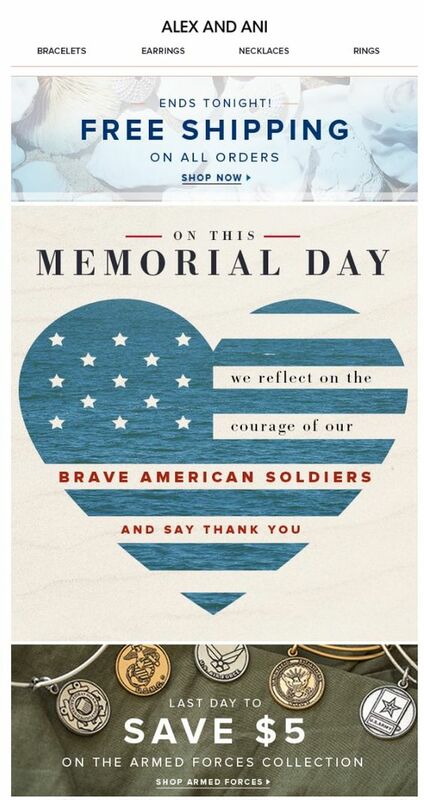 It may seem obvious, but it is important you only send your Memorial Campaign out to your US customers.